There’s nothing better than fresh fish cooked outdoors over an open fire. Although this recipe can be cooked indoors using a cast iron pan, it is completely adaptable to outdoor cooking*! 1. Stir together butter, grainy mustard and 1 teaspoon thyme leaves, set aside. 2. Cut fillet of trout into 4 equal pieces and season with 1 teaspoon of thyme, salt and pepper. 3. Place a cast iron skillet over medium high heat (or over the grate on a campfire) and add olive oil. Add trout, skin side down and cook for 3 minutes. Flip trout and cook for another 2 minutes. Remove trout from pan and set aside. 4. Add the asparagus into the same pan and cook for 6 minutes, stirring often until it begins to char and becomes tender. Remove pan from heat and add the butter mixture to the asparagus. Stir to combine so the butter is completely melted. 5. 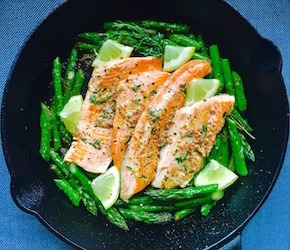 Place fish on plate and spoon over the asparagus and butter. *If cooking over an open flame, be mindful that the temperature can be much higher than a stovetop. Set your pan off to the side, not over a direct flame.